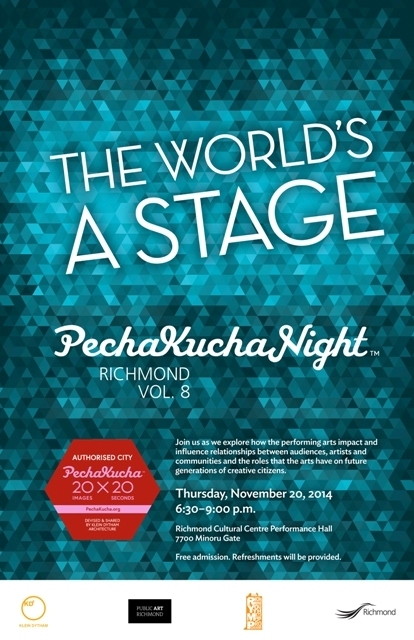 I am presenting amongst other artists at a Pecha Kucha Night in Richmond on November 20, 2014. The event is from 6-9pm and located at Richmond Cultural Centre Performance Hall : 7700 Minoru Gate Richmond, BC. Join me in this fun event! I’ll be showing 20 images of my work in community engaged setting and site specific work. It’s been great to go through Mobile Clubbing pictures, Drift-Walks pictures, Flash Mobs and Stroller Dancing pictures.